Amazing Trophy Speckled Trout Day!!! Wow the big trout were on fire this morning! Tina, Dennis and Jody caught 8 trout over 20″s with the biggest ones at 24, 24.5 and 26 inches!!! Posted in Fishing Charter Pictures	| Comments Off on Amazing Trophy Speckled Trout Day!!! Father and Son from Colorado had a Big Day!! Several big trout, redfish and flounder for Brian and Evan from Colorado!! 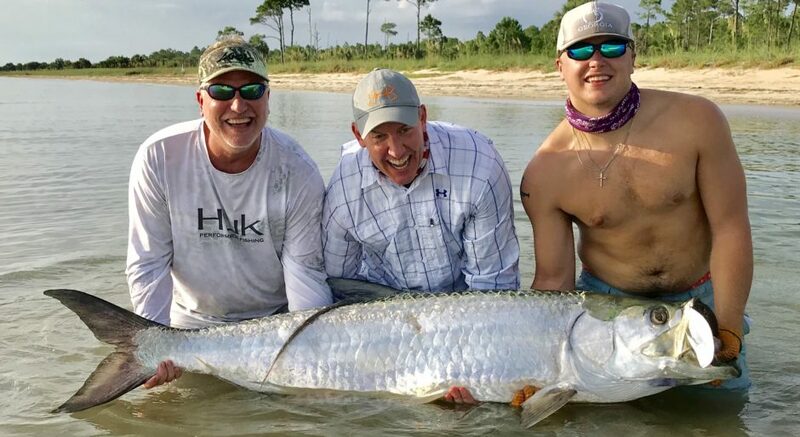 Posted in Fishing Charter Pictures	| Comments Off on Father and Son from Colorado had a Big Day!! Jake, Cliff and Mark got on some good sharks today, broke off 2 giants and Jake caught his first ever triple tail!! Posted in Fishing Charter Pictures	| Comments Off on Shark Mania!! A very nice mix of reds and trout today for Chad, Chase, Avery and Alex!! They caught 9 redfish, 13 trout and 3 flounder!! Posted in Fishing Charter Pictures	| Comments Off on Redfish and Trout Galore!! Wanna Catch A Big Shark!? Little man Johnny caught the biggest trout of the morning and everyone fought and landed a monster black tip shark at over 6 feet long!! Posted in Fishing Charter Pictures	| Comments Off on Wanna Catch A Big Shark!? Good Trips Morning and Afternoon!! The Teter family from Texas caught some nice trout, flounder and jack crevalle this morning; while the boys from Destin put it on the big trout and redfish this afternoon!!! Posted in Fishing Charter Pictures	| Comments Off on Good Trips Morning and Afternoon!! Kids and Sharks and Trout and Flounder!! Had some great kids on board this morning. Dax, Dane and Demi did great catching trout, flounder and an 8-9 foot nurse shark!! Kids definitely rule! Posted in Fishing Charter Pictures	| Comments Off on Kids and Sharks and Trout and Flounder!! Posted in Fishing Charter Pictures	| Comments Off on Abby’s Big Day! Big Fish, Kids and Fun all Day!! Cody was back again this morning for some big redfish, trout and sharks!! And 12 year old Ava got the big shark of the afternoon on the girls trip!! Thanks Suzanne and Al for bringing the girls out!! Posted in Fishing Charter Pictures	| Comments Off on Big Fish, Kids and Fun all Day!! Tropical Storm Redfish and Flounder!! Tropical Storm madness! 12 redfish, 7 flounder and 2 trout!! Cody’s the man! Posted in Fishing Charter Pictures	| Comments Off on Tropical Storm Redfish and Flounder! !